Small pocket cruisers are often so focused on maximizing living space that they lack any pizzazz. Not so, with the Glastron GS 259. Very small cruising boats with overnight accommodations, like the Cutwater Solara 24 or the Bayliner 2455 Ciera Sunbridge, commonly called “pocket cruisers,” usually spare no effort when it comes to creating as much interior living space as possible in a compact package. There’s just one problem: shoe-horning gobs of boat into a tiny platform often means sacrificing traits like performance and/or outdoor deck space. A new pocket cruiser that aims to deliver maximum accommodations while also providing plenty of pep and lots of cockpit space is the Glastron GS 259, which we recently tested on the waters of Sarasota Bay. The verdict? 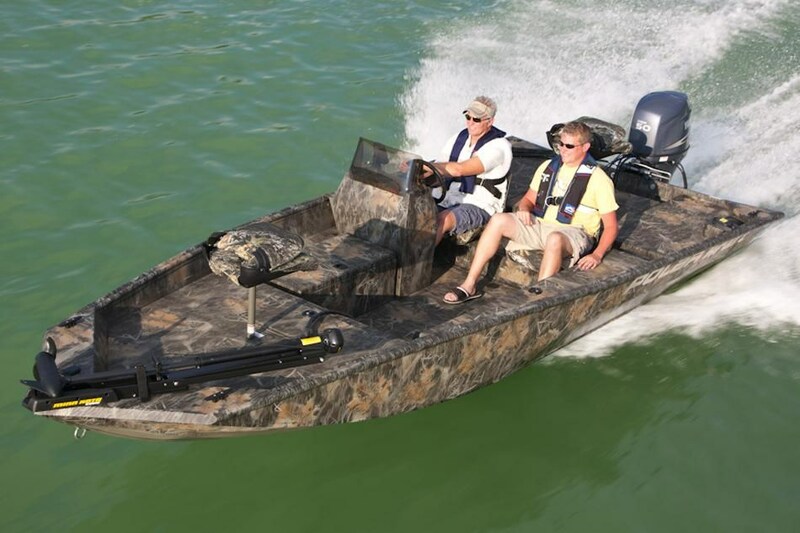 This is one boat that accomplishes its mission. But don’t just take our word for it—hop aboard with us right now for a quick spin. 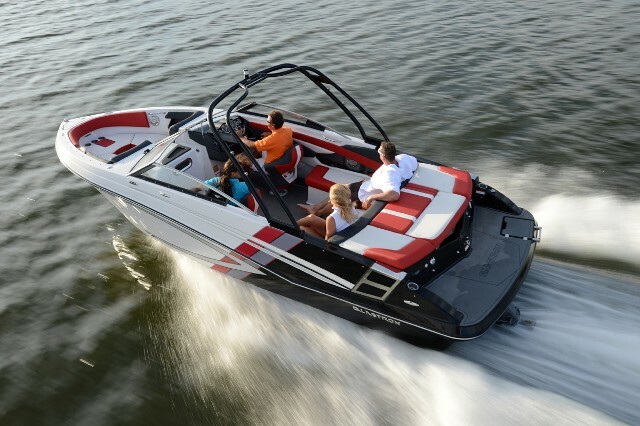 Yes, that cabin is shockingly voluminous for a 25’ long boat. And, would you believe we shot that video with five people aboard? They were able to stay topsides because there’s no shortage of space above decks either. The cockpit has a double-wide helm chair, an L-lounge behind it, a bench lounge at the transom, and a port-side lounge for two. It also features a small outdoor galley with a counter, a sink, a removable 36-quart cooler, and an optional refrigerator. Three steps down there’s a wide swim platform along with an angled re-boarding ladder. 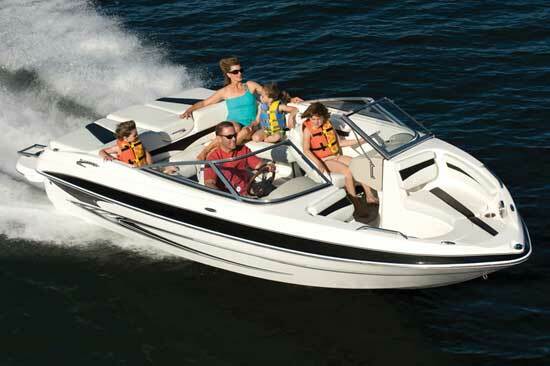 Both inside and out, the Glastron GS 259 will surprise you with how much room you can find in a 25’ long boat. Another nice thing about that cockpit: it’s as adaptable as a Swiss Army knife. If you don’t need oodles of space for seating at any given time, you can convert the starboard and aft seating into a huge sunpad. 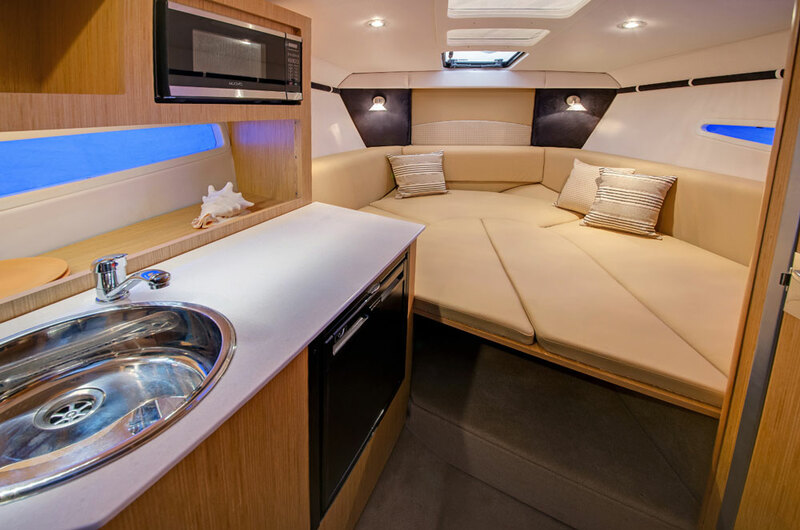 If you’re sitting at anchor and want to enjoy the view off the transom, they convert into an aft-facing lounge. Or if you want to enjoy cocktails at sunset, they convert into a dinette with a table. One space equates multiple uses on the GS 259. Although the video gave you a good look inside the cabin, there are a few details prospective buyers (note: base cost as of this printing, $77,000 and change) will want to know about. The forward dinette, as one would expect, converts into a berth. The head is a full stand-up, and includes a shower with a sump and pump-out. And that big mid-cabin has a queen-sized mattress. While it’s true that carving out room for such a spacious mid-cabin forces the cockpit and helm to be a bit more elevated than the norm, thus raising the boat’s center of gravity, the room Glastron gets out of it will be worth the trade-off to boaters who plan to spend a lot of time cruising. A couple, for example, could comfortably use the mid-cabin for sleeping only, never have to convert the dinette, and spend several nights aboard without sacrificing any comfort nor any utility–both when awake and when asleep. The dinette turns int the forward berth on the GS 259, providing still more convertibility. Despite fitting all this into the 25’ footprint, Glastron still manages to squeeze out some rather peppy performance from the GS 259. 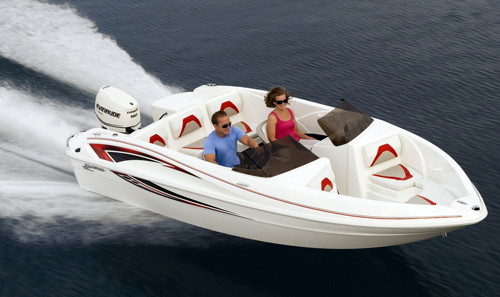 The stock engine is a V6 Volvo Penta, which gets you a cruising speed in the upper-middle 20’s and a top-end in the 40 MPH range. Few pocket cruisers will match it. And if that’s not enough for your taste, shelling out another $5,000 or so allows you to upgrade to a V8. If performance is a priority go for it, but remember that cruising is best done at moderate speeds, and cruising with the V6 in the mid to upper 20’s you can keep fuel burn under 10 GPH. With 70 gallons of fuel aboard, that means you can go for over 150 miles between stops at the fuel dock, with plenty of reserve. 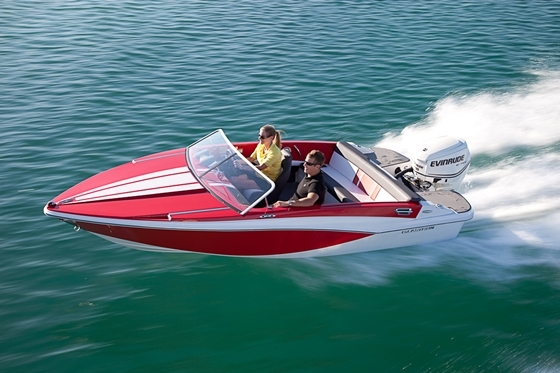 Would you want to spend a solid month aboard the Glastron GS 259? Nah, that would be a bit excessive. But a long weekend of cruising down the bay? Maybe even a full week of cruising from port to port? Absolutely. 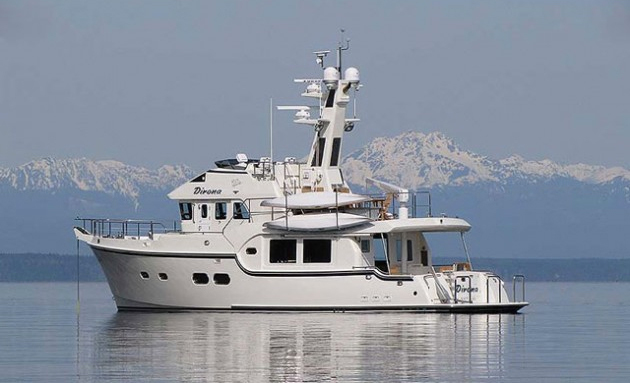 Even though this boat is a mere 25’ long, it has everything a couple needs to enjoy some extended time aboard. Better yet, they’ll be able to enjoy some sporty cruising, too. 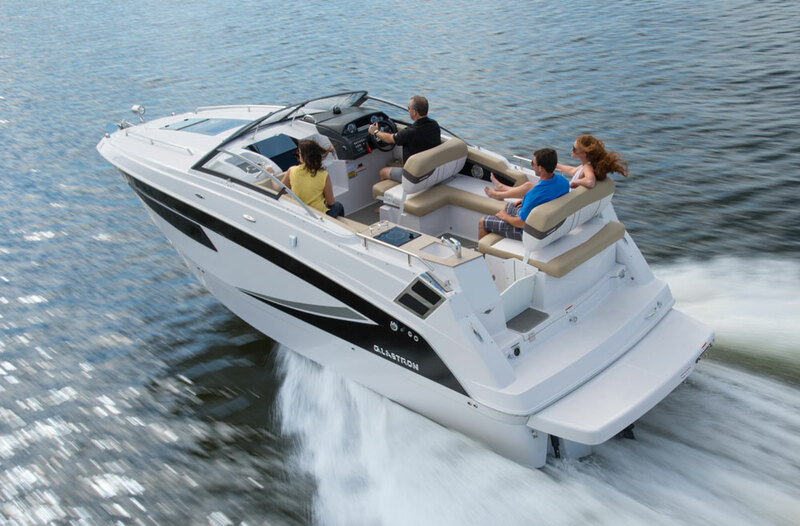 Other Choices: The Cutwater Solara 24 and the Bayliner 2455 mentioned earlier should be checked out. 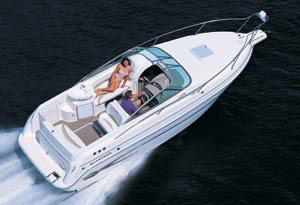 If you’d consider going up a step in size and price, you may also want to look at the 26’7” long Sea Ray 260 Sundancer. For more information, visit Glastron. 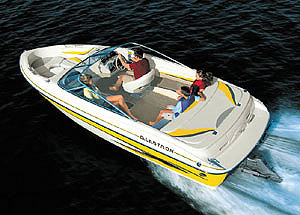 See Glastron GS 259 listings.